I had an early start to Christmas Day. I volunteered to make the breakfast, I love holiday breakfasts. As soon as I woke up, I prepped the food. 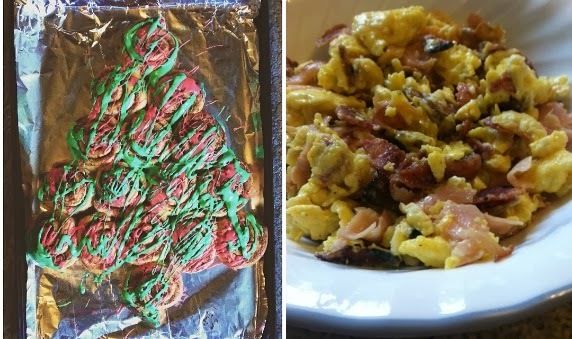 I made a cinnamon roll Christmas tree, and fully loaded scrambled eggs with bacon, cheese, and ham. On the cinnamon roll Christmas tree, I dyed one of the icing packets green, and another icing packet red, I drizzled on the icing and the tree looked scrumptious! After breakfast, we opened presents. My sister and I always get a few things for both of us, so this year we received The Office Trivia Game, and the movie, The Blind Side. I received money, a fitness ball, and an iPhone 5 case that looks like a mason jar. We have to exchange it because I'm getting the iPhone 5C soon. Brittney received socks and money. All she wants is money. After presents, I whipped up another monkey bread to take over to my Grandma Biggs's house. We always spend Christmas Day over at my Grandma Biggs's house, another tradition. 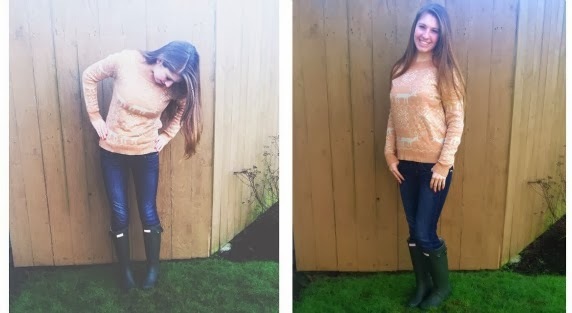 I wore my new boots to my Grandma's house. I felt pretty trendy. 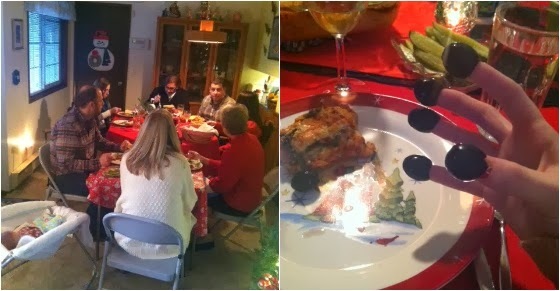 My family arrived before my Uncle Randy and my Aunt Aimme, so we helped my Grandma in the kitchen a bit. 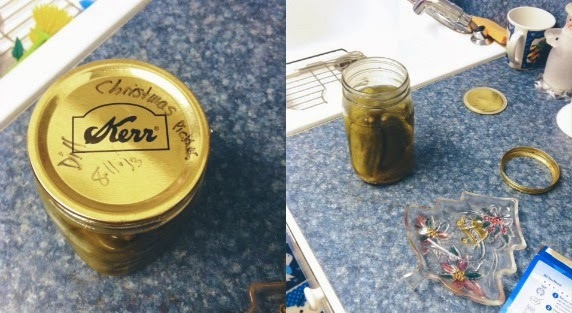 My Grandma pulled out the jar of the Christmas Pickles we made in August. We each had twelve jars, but one was left over. We decided to make that jar the Christmas Pickle jar. We opened the Christmas Pickle jar, and they tasted delicious. Of course they did! This year, we had a new, little addition to our family. 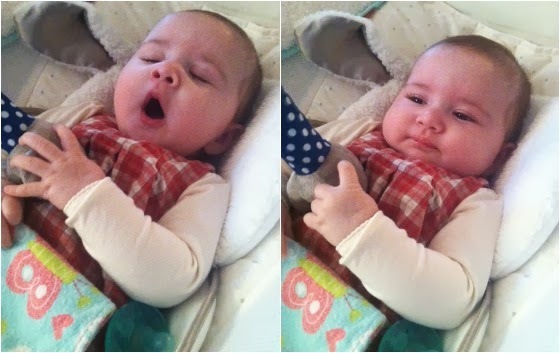 Little Quincy Biggs, my new cousin had her first Christmas this year! I gave her little bath toy duckies for Christmas. 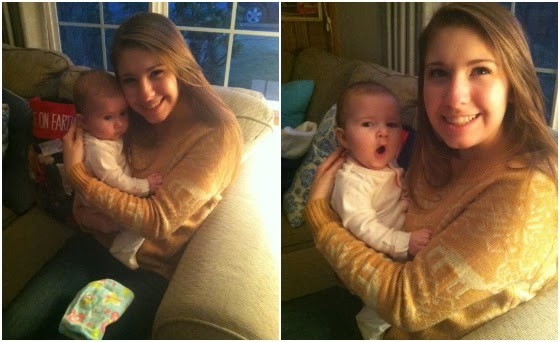 She is so fun to snuggle. My dad and Quincy had a little bonding session too, that was too cute. Before we ate dinner, we opened our stockings from Santa. Grandma always has Santa come and leave us stockings. The neatest item I received in my stocking was a big Starbucks tumbler. You could put your own paper in one part of the cup. I was so excited about it! I went to Craft Warehouse yesterday and bought a lavender sparkly paper to go in the cup. The stocking had some candy in it, along with an EOS, and a little note pad, an orange, and some lotion. I love my Starbucks cup. I use it everyday. Aimee brought the main course. 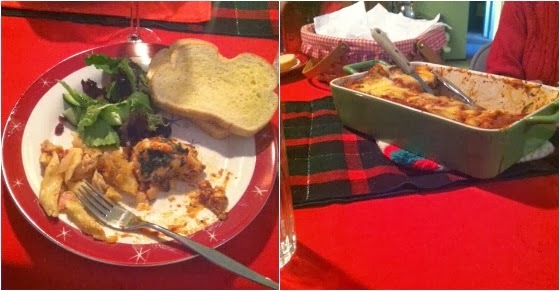 She made an amazing spinach lasagna and chicken carbonara. Oh my goodness. So delicious. I couldn't stop eating it, my stomach was telling me that I was full, but I had to keep eating, it was just so good! At every meal we have over at my Grandma's house, we always have whole olives. When I was little, I would put them on my finger tips. At Thanksgiving, my Uncle Randy asked me if I put the olives on my finger tips and I said "no". He seemed a little disappointed, so to make it up to him, I put the olives on my fingers again, just for him. 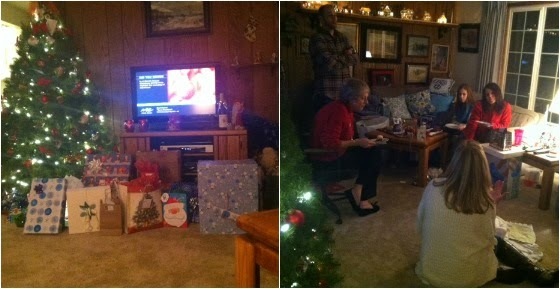 Once dinner was done, and somewhat cleaned up, we sat in the living room, all in a circle and we opened presents. My Grandma has a certain way of opening presents, where one person goes at a time. We went in alphabetical order. Aimee, Ann, Brian, Brittney, Courtney, Quincy, Randy, Steve, Tanya. The adults draw names for Christmas, and my mom drew my Grandma. Over the past month, my mom has been so crafty. She made this giant B for Biggs. She covered it with pictures of Brittney, Quincy and myself. When my Grandma opened it, she began to cry. I was so excited for her to open it, her reaction made my day. It was more fulfilling than any of the presents I received. I started to cry too, and then Aimee started to cry, my mom started crying, everybody cried. I really wish I got pictures of her reaction. 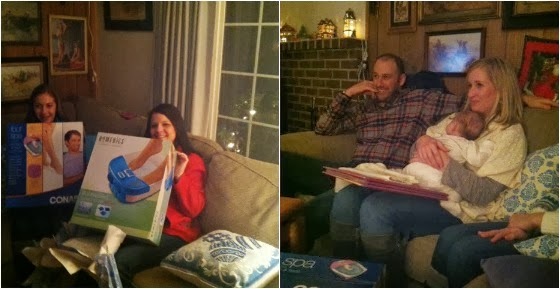 We continued with the presents, my Uncle Randy and Aunt Aimee gave me something very special. On Pinterest, I had been admiring a set of measuring spoons from Anthropologie. 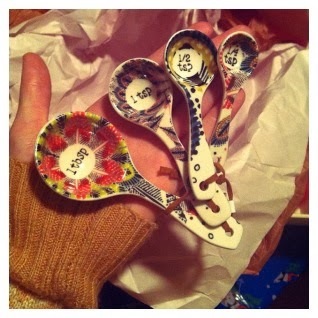 I opened this beautiful box, and unwrapped the set of the beautiful measuring spoons. The design and color on these measuring spoons are absolutely stunning. I also received a tote bag from Anthropologie from my Aunt Aimee and Uncle Randy. I am really excited to use them! My Aunt Aimee drew my mom's name, and gave her a foot spa. My sister also received a foot spa from my Grandma. We went home with two foot spas! My Grandpa gave me a watch that had Minnie Mouse dressed as a nurse on the watch. I love how my family is so supportive of my career choice. Quincy was passed around for snuggles, and my dad and my Grandpa were chatting away. It was how Christmas was supposed to be. I'm glad I took a picture of the tree before we ripped open all of our presents, there were so many gifts under the tree. After gifts, my grandma brought out the desserts. She made chocolate pudding pie, my mom made M&M brownies with peppermint ice cream, and I made monkey bread. We sat around and talked while eating. It was a very Merry Christmas Day. 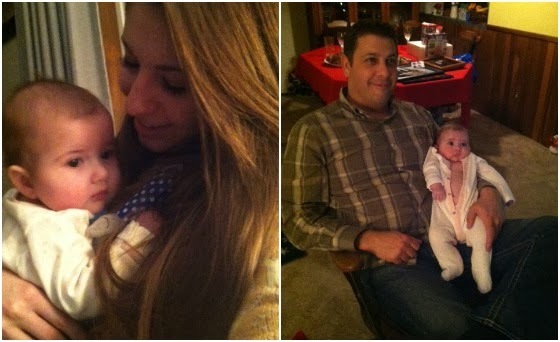 The best gift was spending the day with my family. Diêu Tích Tuyết ở xa xa lại biến sắc, nhìn chằm chằm vào Vương Lâm, trong lòng như nổi sóng, nàng nhớ tới lời nói của phụ thân. Đối với Vương Lâm, phụ thân Huyết Tổ của nàng có chút chú ý.
Một luồng ma khí từ trong cơ thể Vương Lâm lan ra, trong phạm vi ba trượng quanh thân hắn hình thành một màn sương đen nhàn nhạt. Trong màn sương đen, hai mắt Vương Lâm dần dần lộ ra vẻ âm trầm. Sự âm trầm đó toát ra một thứ lạnh lẽo, ma tính! “Thần thông Niềm tin… Khi ta thi triển pháp thuật chỉ có vẻ ngoài, không chứa niềm tin bên trong, cho nên không thể phát huy ra uy lực chân chính”. Vương Lâm thì thào tự nói với bản thân. Hắn nhìn ngón trỏ tay phải mình, rồi chỉ thẳng lên trời.